Devices supporting HD-SDI (YCbCr) signals can be configured to carry either legal range signals (which is a standard use case for most of all HD-SDI signals) or extended range signals (which is only used in special, rare use cases). A 10-bit digital signal can theoretically carry code values from 0 to 1023. A legal range signal only uses code values 64 to 940 (for the Y channel) while an extended range signal uses code values 4 to 1019 (for the Y channel). 3D LUTs are applied on RGB images. In post production systems, RGB images are usually using all the code values available – so for example a 10-bit RGB image uses code values 0 to 1023. This means that lookup tables made for post production systems expect that code values 0 to 1023 should be transformed with that LUT. To be able to compute color manipulations in a defined code value range, LiveGrade converts incoming signals so that code values 0 to 1023 are used (see Figure 1). So the processing chain of LiveGrade simulates a post-production pipeline for color processing. This means that LiveGrade’s CDL mode always will expect regular, “extended-range” lookup tables (3D LUTs). Please note that the order of CDL and LUT can be changed. Please see KB 435 for more information about the CDL grading mode. The HDLink device doesn’t know what kind of signal is coming in (legal or extended), so LiveGrade takes care about this and converts the signals accordingly as part of the color processing – depending on what is set in the device manager. So as long as you properly specify in the device manager which kind of signal you’re feeding in, the look (e.g. CDL and and imported LUT) will always be applied correctly. See KB 238 and KB 216 for more information about the device manager. Another example shows a situation, where the input signal is an extended range SDI signal, LiveGrade (as always does the color manipulations in RGB (“full range”) and converts the signal in a way that the HDLink device sends it out as a legal-range SDI signal (Figure 2). 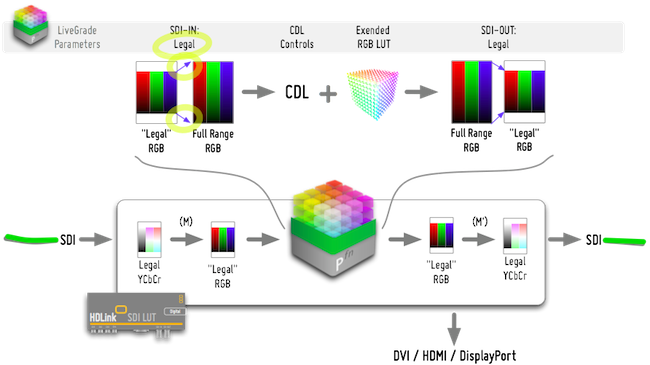 NOTE: A situation where you would use a “legal range” 3D LUT is when you want to load it directly into HDLink with the HDLink Utility application for use with legal SDI signals. Then the LUT will have to be suited to the signals coming in. In LiveGrade only “full range” 3D LUTs are used, as in most post production tools.